Wedding Planning 101 – How to Fix the Biggest Problem of Choosing Your Wedding Party People? So you’ve been the ladli of your family, the favourite of all your cousins, the friend in need for all your school, college, as well as work buddies. Now with the announcement of your engagement out there in the open, you see all the gleaming faces that are waiting to eagerly be a part of your big day. While some may be glad to simply attend the function, others may want to be an integral part with the wedding planning. Since you cannot have hundreds of people managing your big day, the big question arises – how do you choose your wedding party people? Since the bride and groom can’t manage throwing such a big party on their own whilst being busy getting married themselves, wedding party people are their helping hands who take care of them and things related to celebration ensuring it’s a smooth and fun ride for the couple and attendees. So, if your confused rather aghast deciding who makes the cut to your wedding party list of people, we give you a simple solution. Gear up for your wedding planning 101! The bigger the celebration the more helping hands will you need. Considering how grand or intimate your wedding celebration you wish to keep will be a major deciding factor on how many people you need to include in your wedding party. If you’ve deciding on having an intimate celebration, yet want to include more people, assign them small but useful roles, such as arranging the varmalas, or mehndi favours, selecting the sangeet songs etc. As easy as it may seem like reading ABC, picking your wedding party people is the toughest of all wedding planning steps. Whom to choose and whom to not without offending anyone is like escaping a fish tank filled with piranhas. As much as you’ll be tempted to include your entire favourite friends and relatives troupe in your wedding party list of people, hold your excitement and take your time, say a month or so. Include only those who you think will stand beside you through your thick and thin times 5 years down the line. That should pretty much do the trick to help you finalize who makes the cut. Once people get the news you’re about to board the bride bandwagon, you will definitely come across all those long lost relatives, friends and super excited Auntyji’s who want to be a part of your celebration. Don’t make the mistake of choosing people just because you want to return some kind of favour to them. They may have been good to you once upon a time, but that doesn’t mean your wedding is the time to reciprocate with goodness. Explain to them it’s tough to not include them in your wedding party list of people and that at this point of your life you want only people closest to you to be more involved. To make them feel a little better let me know that you had to leave out many people as close to you as them. Ensure your wedding party people are the ones you can rely on. Though you may have the biggest fondness over your closest Aunt and would want to let her take over the entertainment bit of your mehndi ceremony, but in reality if she is the kind who doesn’t even know what are the fun ways to involve your guests or turns out to be a bore herself, imagine what a flop the festivity would be. Play safe in choosing reliable people whom you can blindly trust for their taste and preferences in little elements, definitely giving high importance to your likings first, after all it’s your day. Don’t forget to personalize the planning process by giving special tags to your wedding party, such as the bride’s caretaker, or the groom’s right hand. This is just to add a dash of fun into the serious wedding planning process. Goes without saying after your parents, immediate in line of assigning duties are your siblings and cousins. Even if you may not be that close to each other, sharing the dirty secrets sorts, they have a certain responsibility towards the celebration and so don’t shy away from assigning duties to your bade bhai or choti didi. 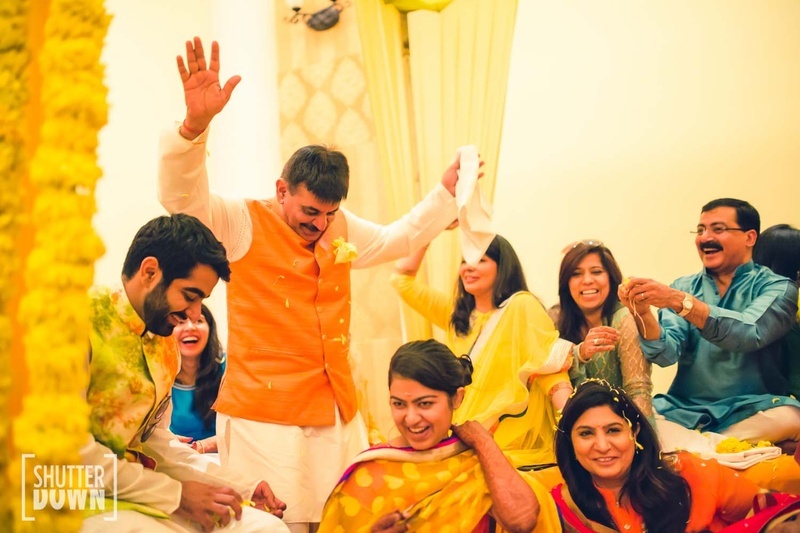 If you have a humungous family line, it is not necessary to include all, just pick out the teenagers as they’re super enthusiastic to take on roles with event management, as this also helps them earn a little pocket money from uncles and auntyji’s attending your celebration in the form of shagun. Your wedding party people needn’t be just the ones who are handling major roles. If you wish to take your celebration a notch higher with some personalization you can always approach and include friends who are blessed with special talents and could contribute to your wedding in a unique way. For instance, if you have a friend who sings well, have them perform a live number at your sangeet or if you have a friend who is a pastry chef let them prepare some sweet treats that you could give away as wedding favours. Kids can be super fun to include in your wedding party too. They can be the announcement bearers at your wedding just before you are about to make your grand entry. If you have friends or relatives staying in a different city or country all together, it’s stupid to assign roles like managing transportation for guests or catering for your pre-wedding for instance. If they cannot devote their full-time to such major roles, give them light tasks on the day that are manageable, like taking care of drunken guests at your cocktail party or moving gifts given to the bride and groom to the car. Easy, right!